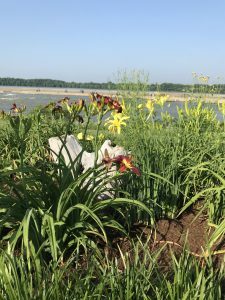 Amedisys Hospice has created a memorial garden at the Falls of the Ohio State Park. 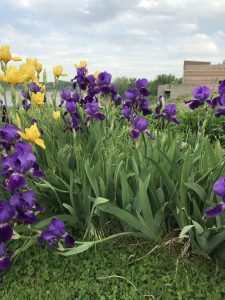 The purpose of this garden is to give families they have cared for a place to go for solitude and a time of reflection upon their loved one’s life. They are extending the use of this garden to the local community, which means that their family member need not a present or former Amedisys patient to participate. 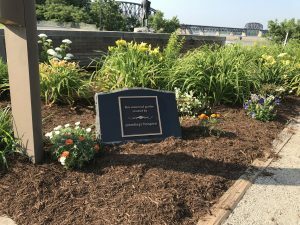 The staff of Amedisys Hospice dedicated this garden along with family members in June to those they have lost and planted flowers in their loving memory. A memorial bench and stone are the centerpieces of this memorial garden which all can be a part of. Bill Slayton, MACM, Bereavement Coordinator, Chaplain works in the garden several days a week. The flower blooms change frequently and it is particularly wonderful in the early morning and evening. Please take time to see it the next time you visit and tell Bill what a beautiful place it is.